On March 28, the Quebec government tabled its proposed secularism law, which would bar anyone working in the public sector in a ‘position of authority’—including bus drivers and teachers—from wearing visible religious symbols such as the hijab and kippah. Like the failed 2013 Charte des Valeurs , Bill 21 is a thinly-veiled attempt at marginalizing religious minorities. Between the introduction of Bill 21, the rising numbers of hate crimes, and the recent white supremacist attack on a mosque in Christchurch, New Zealand, hate is increasing, affecting the safety and wellbeing of McGill’s students of colour. All students should do their part to ensure that the campus remains a welcoming environment. Montreal has the fifth-highest rate of hate crimes in Canada, and Quebec City comes in fourth. Quebec is home to La Meute, a far-right, anti-immigration hate group which former members estimate has 4,000 to 5,000 constituents. In La Meute’s public Facebook group, nearly 200 members celebrated the announcement of Bill 21. McGill does not exist in a vacuum: The increase in hate crimes in Quebec leaves racialized and marginalized students vulnerable to violence and harassment, on and off campus. In September, a white-supremacist group called Generation Identity hung posters spewing racist rhetoric around campus. The Christchurch shooter, who expressed sentiments similar to Generation Identity’s about immigration, donated $2,000 to its Austrian chapter in 2018. Though these hate groups may be a minority in Quebec politics, they can have an outsized influence on citizens’ safety. 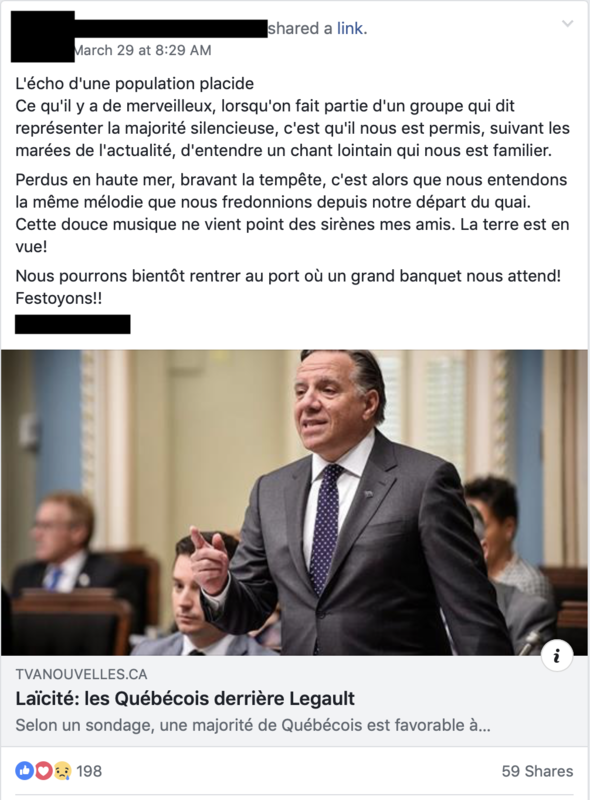 Premier Francois Legault, leader of the Coalition Avenir Quebec, made a reference to ‘Quebec values’ in a public address about Bill 21. Hate groups and mass violence represent the most extreme manifestations of racism, and they are often beyond individual students’ control. However, racism also manifests in more subtle, pervasive ways—and it is important to respond to these everyday instances. Allyship is more than a buzzword: A dedication to advocating for issues that might not affect oneself directly is imperative. Indigenous and non-Indigenous students came together to sign the #ChangeTheName campaign’s open letter and attended the protest, which proved the student body’s support for the cause and highlighted the need for action on the McGill administration’s behalf. Students have demonstrated their capabilities for advocacy through the great attendance of the climate justice walkout on March 15. It is imperative that students continue to put in that same effort to advocate for marginalized students: That means showing up to protests, vigils, other demonstrations. Supporting the continued existence of on-campus resources for marginalized students—such as the McGill Office for Religious and Spiritual Life, the Muslim Students’ Association, and the Black Students’ Network— is especially important given the rise of hate crimes. Marginalized and racialized students need these safe spaces, and continuing to support them is imperative. McGill’s administration must consider the rise in far-right rhetoric and hate crimes as they restructure the Social Equity and Diversity Education Office (SEDE), which, in addition to providing equity and community outreach programming, is a central hub that can refer students to cultural and religious student groups. From the provincial government’s support for Bill 21 to the rise of hate crimes, and the prevalence of hate groups in Montreal and Quebec, marginalized and racialized students are increasingly forced to face this sinister reality every day. McGill does not exist apart from the world surrounding it, nor do its students. Action against hate requires collective solidarity, and all students are responsible.